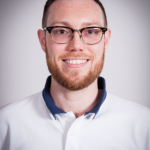 Darren Brown is a clinical Physiotherapist specialising in Infectious Diseases, Oncology and Palliative Care at Chelsea and Westminster Hospital NHS Foundation Trust, London, United Kingdom. His clinical and academic interests are HIV, disability and rehabilitation. Chelsea and Westminster Hospital NHS Foundation Trust is the largest HIV unit in Europe, and Darren leads the HIV Physiotherapy service providing both inpatient and outpatient Physiotherapy interventions for adults living with HIV. Darren has created and developed the Kobler Rehabilitation Class; a group rehabilitation intervention for people living with HIV providing individualised exercise and HIV-specific education. He invented the mHealth app BeYou+ (@BeYouPlus), which supports self-management strategies among people living with HIV. Darren is the HIV/AIDS special interest coordinator of WCPT Network IPT-HOPE, the vice-chair of the UK Rehabilitation in HIV Association, and a member of the Canada-International HIV Rehabilitation Research collaborative. HIV - What has Physiotherapy and Rehabilitation got to do with it?